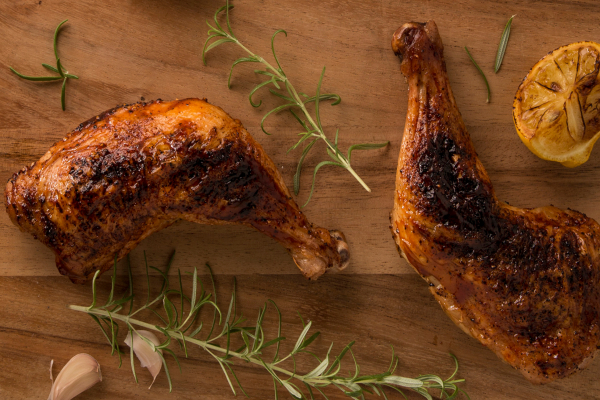 Making Meat And Poultry Products Look Better, Taste Better And Last Longer—Naturally! Consumers are wary of the chemicals added to the foods they consume—thus, food processors are looking for naturally sourced options to allay consumer worries, says Poulson Joseph, Ph.D., Director of Protein Innovation, Kalsec. Food manufacturers respond to and predict the ever-changing wants and needs of consumers. We found there are three factors that are always important to the consumer: products that look better, taste better and last longer. Meat and poultry processors, in particular, respond to the needs of consumers. In the past, processors relied on synthetic antioxidants, such as BHA and BHT, as effective, low-cost solutions to extend shelf-life. However, consumers are becoming wary of the chemicals added to the foods they eat. 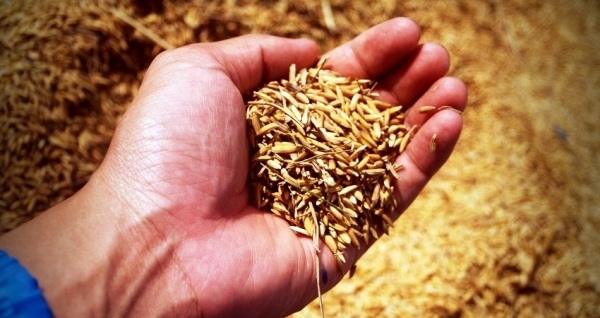 As a result, processors are looking for naturally sourced options. 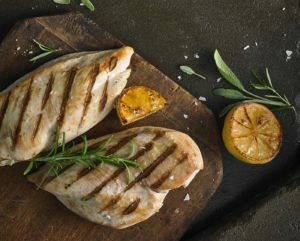 In a recent online global survey conducted by Kalsec, meat and poultry were chosen most frequently by consumers as the categories most expected to have clean label attributes. How can meat and poultry processors make the shift from synthetic to naturally sourced antioxidants? Begin by selecting an ingredient supplier that understands ingredients and how they work in your food system. Fresh ground meat and sausage represent a major share of meat retail sales, offering a variety of options to consumers. Appearance of these products is critical at the retail case, with most consumers preferring cherry red ground beef colour, which they associate with freshness. As many processors know, oxidation reactions in meat and poultry can cause a loss of colour. Any discoloration will result in discounted prices or disposal, leading to a loss of revenue and an increase in food waste. 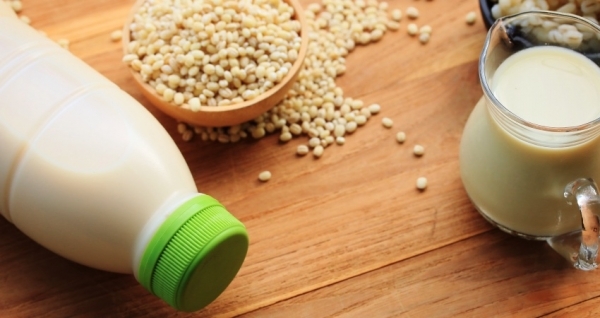 Shelf-life extension improves profitability and reduces waste. Naturally sourced antioxidants extend the colour life in case-ready packaging conditions while limiting lipid oxidation. Rosemary has been the traditional ingredient of choice used as an antioxidant in a wide range of applications, including meat and poultry. 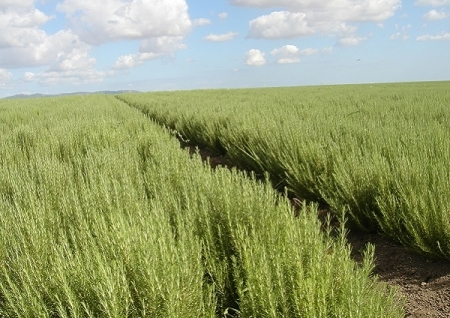 The flavour and aroma of rosemary is often less objectionable than other spices and herbs. However, combining rosemary and acerola extract has demonstrated additional colour stability in products such as fresh ground beef and fresh pork sausage. Combining rosemary and acerola extracts together makes for an optimal ingredient combination that offers additional colour stability and extended flavour in meat and poultry products under various packaging conditions. This enables retailers to reduce the amount of price markdowns and sell more case ready meats, thus increasing revenue and reducing food waste. Finding the best solution to combat lipid oxidation in cooked meats and poultry products begins with an understanding of what lipid oxidation is and the effect it has on a food product. In cooked meats and poultry, lipid oxidation results in undesirable off-flavour and off-aroma described as ‘warmed-over flavour’ (WOF). Unappealing flavours directly affect consumer purchasing behaviour. Flavour protection, therefore, is an ongoing concern in partially cooked (frozen) and cooked meat and poultry products that are either ready-to-cook or ready-to-eat. Cooked chicken and turkey are highly susceptible to the development of oxidized flavour during storage. This ultimately influences acceptance of the product in providing a quality eating experience as well as re-purchase decisions of consumers. Today’s consumers seek convenience, making frozen and ready-to-eat meat products a preferred category. It is critical to ensure oxidative stability and flavour quality in protecting your product and your brand image. 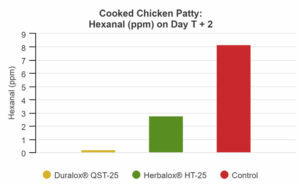 During Kalsec testing, the antioxidant performance in freshly ground chicken breast patties was analysed. 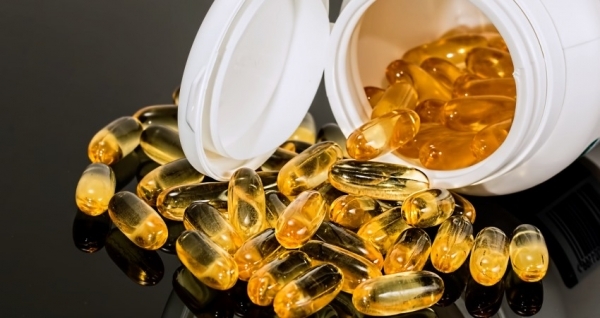 A control sample without antioxidants was compared to a sample treated with rosemary extract (Herbalox HT-25 Rosemary Extract) and a sample treated with a combination of rosemary and green tea extracts (Duralox QST-25 Oxidation Management System). The patties were cooked to an internal temperature of 74 deg C, chilled, and kept in permeable packaging under refrigerated storage (0 to 3 deg C) for two days. Descriptive sensory (trained panel) and instrumental (Hexanal, Gas Chromatography—Static Headspace) evaluations were conducted to assess oxidative stability. Both naturally sourced antioxidants outperformed the control sample, with the rosemary and green tea extract sample having the lowest scores for WOF aroma and flavour, as indicated by the sensory panel. The instrumental evaluation of lipid oxidation (Hexanal by Gas Chromatography) further confirmed these findings as indicated in the figure below. This study proves that the addition of naturally sourced antioxidants significantly improves the shelf-life of a ground chicken patty. This means a reduction in food waste and an increase in cost savings for the processor. Food safety is an ongoing concern for consumers and the food industry alike. Temperature variations, long distances of distribution, and demand for cleaner labels have all contributed to an increased risk of microbial spoilage in further processed meat products. While a naturally sourced antioxidant, such as rosemary extract, is effective in extending shelf-life, it does not have antimicrobial properties to combat food spoilage. In experiments conducted by Kalsec, it has been proven that by combining rosemary extract with buffered vinegar (Kalsec product Duralox NV-3, NS) in fresh bratwurst products, one can inhibit rancid flavours, discoloration and the growth of spoilage organisms. A similar study conducted on fresh ground poultry showed that Duralox NV-3, NS significantly delayed microbial spoilage during refrigerated storage. Sensory evaluations also confirmed the maintenance of flavour stability. For more than 30 years Kalsec has been a leader in the development of innovative antioxidants, including our Herbalox rosemary extract and Duralox oxidation management systems. Herbalox rosemary extract is ideal for a diverse selection of applications, including meat, poultry, oils and snacks. 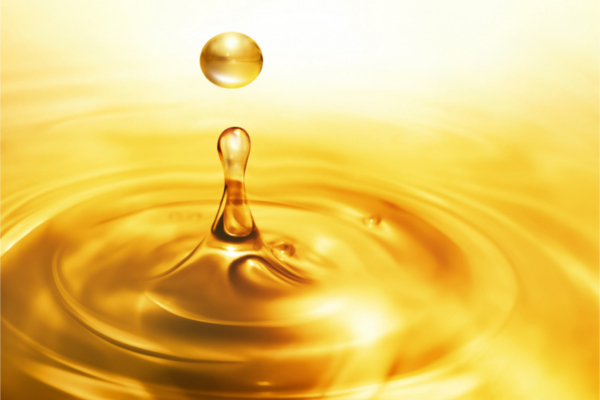 Our proprietary extract and processing techniques allow for the retention of all the useful phenolic compounds. Our Duralox oxidation management systems are based on the use of Herbalox rosemary extract, green tea, acerola, and/or mixed tocopherols, plus the addition of quenchers or chelators. Using component synergies, Duralox systems provide maximum protection from multiple aspects of oxidative deterioration and are designed for specific product and processing conditions unique to each application.